Great, but was it necessary to name (blame?) Transportation Alternatives in the memo to officers? The question is, if this notice was posted by the Precinct a month ago, whether anything in the neighborhood has changed. Things have changed, remarkably so. Mott Street is completely clear of permit parkers on most days, and you can’t believe the difference. The triangle at the entrance to the Manhattan Bridge has been clear for the past two weeks. Other streets are gradually getting better. At a recent Chinatown Consolidated Benevolent Association (CCBA) meeting, Dep Insp. Yee said he had asked DOT for formal, permanent, NO PERMIT AREA signs to go up. The aggrieved community members also presented him with a large stack of letters of appreciation. 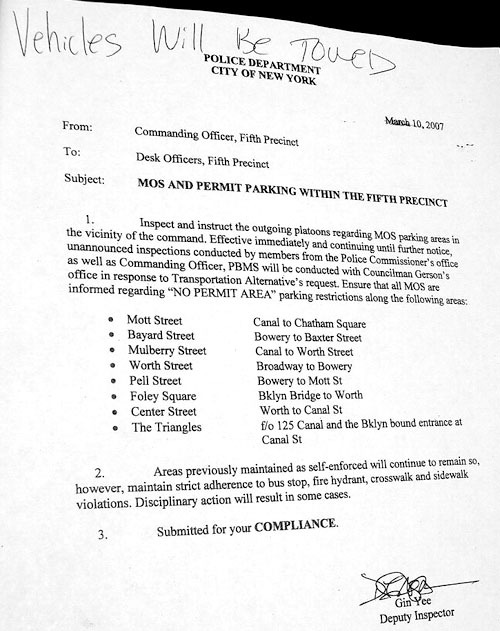 We jumped the gun and put this up on 3/28 for about an hour until we were told that we didn’t have permission from the source of the NYPD memo to publish that. So we took it down and waited for permission with apologies to the source of the memo. This pct is very well served by subway. Maybe it’s the place to start some kind of parking cash-out pilot program. The cops are getting the stick, maybe time for a little carrot. Who determines how many self-enforcement slots are designated? My guess is that PD tells DOT where to put the signs. Problem is that all parking spots are not created equal, so just allocating based on Pct head count doesnt take into account the large local impact in places like Midtown. There was an article in The Villager several weeks ago about the popular new C.O. of the Fifth Pct. getting booted out over the enforcement against permit abusers. Is it possible that the new C.O. is continuing where the old C.O. left off? It appears that being from the neighborhood and knowing the Chinese community helps them understand the effect of the illegal parking! From what I understand talking with CB 3, the rumors about C.O. Lau getting pushed out because of the permit abuse were just rumors. Apparently he says he left to spend more time with his family, his young children. Regardless, when I spoke to Yee about the issue, thanking him for his efforts, he looked at me with an expression of, “It’s that surprising that I’d be enforcing the law?” Still, he must have received some kind of go-ahead from 1 Police Plaza, because this would never fly otherwise. Streetsblog, keep up the good work in your fair and accurate reporting about the years of parking abuse, the community outrage, and the recent responsible policing by our precinct commanders in the 5th. As of June 07 Dep. Inspector Yee has continued his campaign against illegal placard parking by ANY agency. 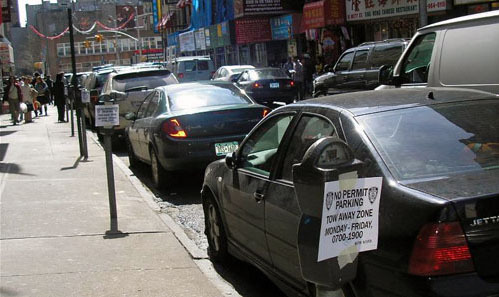 It is true that he is behind the idea for permanent signage in Chinatown to further drive home his point that no agency placards will be allowed within the restricted zone. Yee said that community complaints are part of what drove him to act swiftly and forcefully to get the message across, SO the moral of the story is don’t give up. We’re ever-vigilant in Chinatown, and we document everything constantly. Violators beware. Legitimate NYPD personnel occassionally need to use a placard for brief visits to the courts, and headquarters, no one is arguing that point, it is the responsibility of R. Kelly and Bloomberg to eliminate all non-essential placards from existance, and for goodness sakes STOP giving out more of them!.